Today encrypted peering (IPSEC tunnel) between two VPCs is carried out by two gateways (EC2 instance based), one in each VPC. This limits IPSEC tunnel packet throughput to the throughput of a single instance. For example, AWS C4.4xlarge provides up to 1.5Gbps for an iperf test with TCP. There is no solution for use cases that requires more than that throughput with one gateway instance. AWS infrastructure has its own performance limitation. Traffic leaving a VPC has a bandwidth limit of 5Gbps for one direction and 10Gbps for bi-directional. This limitation applies to both intra-region VPC traffic and Internet bound traffic. For example, running an iperf test between two instances in two VPCs in the same region yields 5Gbps one way throughput and 10Gbps bi-directional traffic. Aviatrix has developed a scale out IPSEC capability. A VPC can deploy a cluster of gateways. Encrypted peering between two VPCs is carried out by two clusters of gateways in each VPC. The deployment diagram is shown below. Aviatrix supports both inter-region cluster peering and intra-region cluster peering. In the first case, the encrypted cluster peering is over the Internet through IGW. In the second case, the encrypted cluster peering is over native AWS peering. The deployment diagrams are described below for both cases. In this example, three Aviatrix gateways are deployed for encrypted peering between VPC-1 and VPC-2. A demux gateway is used to distribute user instance session traffic to 3 gateways. The distribution algorithm guarantees no packet for the same TCP stream is delivered out of order to the peering VPC. Below is the performance benchmark for cluster peering using the iperf tool. The results are collected with encryption over AWS peering in a same region. The Aviatrix Gateway size is C4.8xlarge. The demux gateway size is C4.8xlarge. As the results shown, with 4 or 5 gateways in a cluster, performance reaches AWS VPC line rate. 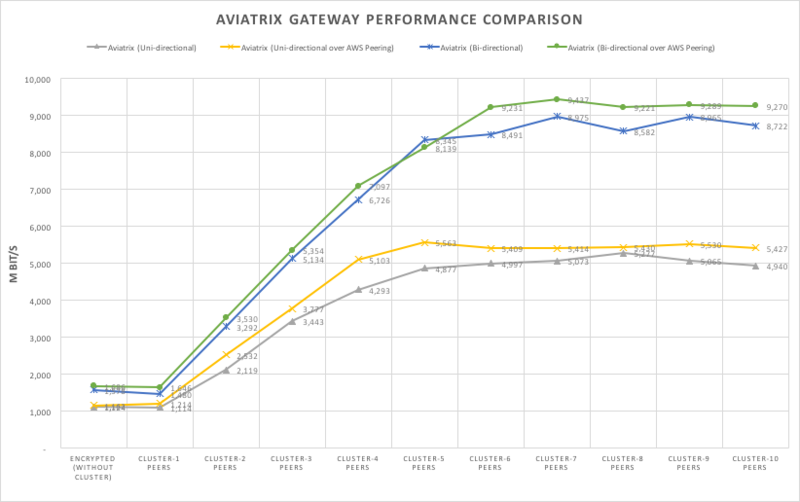 Adding more gateways does not improve the performance. Note if the gateway size is C4.xlarge, more gateways are needed to achieve AWS line rate. The AWS Controller monitors the health of the peering gateways and demux gateway. When heartbeat information from any gateway fails, the Controller will restart the failing gateways. The detection to failover is under 30 seconds. Before you start make sure you have the latest software by checking the Dashboard. If an alert message (New !) appears, click New! to download the latest software. We assume you already know how to deploy the Aviatrix solution, if you need help, check out this reference design. The Cluster Peering work flow is as follows, with major steps highlighted. Repeat the above step to create 2 more gateways in VPC-1. Note all gateways instances must be in the same subnet. Go to Peering -> Cluster Encrypted Peering -> + New Cluster. Make sure you highlight and select all 3 gateways at the “Highlight and Select Gateways” field. Go to Peering -> Cluster Encrypted Peering -> Cluster Peering -> +New Peering, enter the two clusters you created in the previous steps. Special Notes. Select “Over AWS Peering” if the two VPCs are in the same region. Note when this option is selected, you must have AWS peering routing PCX programmed in the routing table only for the subnet where cluster gateway instances are deployed. You must NOT program PCX for routing tables whose associated subnets are where your application EC2 instances are deployed. Once peering configuration is completed, you can view it in dashboard. Cluster peering is drawn with a thicker green line. Note if you wish to add more gateways once a cluster peering has been created, you need to unpeer the cluster peering first. Add more gateways in each VPC, then create cluster peering again. You can create multiple clusters in a VPC. A gateway may also belong to different clusters.